Jed Wallace revealed his pride at landing the League Two player-of-the-month award but is now focused on his next mission. The Blues midfielder enjoyed a fine February, with his performance in the 6-2 win at Cambridge the stand-out. That saw him voted as player of the month and it was a Pompey double with Blues boss Andy Awford collecting the manager’s prize for the team’s recent resurgence. 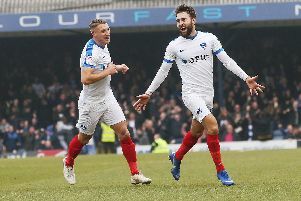 While Wallace’s trophy will join the award he picked up as The News Sports Awards’ Pompey player of 2014 recently, he is determined to play his part in helping the Blues continue to climb the table. ‘I think everyone knows my desire to get out of League Two with Portsmouth,’ said Wallace. ‘These awards are great to get noticed for but you’re only as good as your last game. It’s nice to be recognised for the first time. But now it’s all about looking forward. ‘It’s nice to be recognised for the first time but now it’s all about looking forward. Awford oversaw an unbeaten run over the month and picked up 14 points from six games. He said: ‘I receive the award but I do it on behalf of the club. ‘It’s not just about me, it’s about the staff and the players who deserve massive credit for the amount of points they took in February.